Preferred Habitat: Fields and pastures. 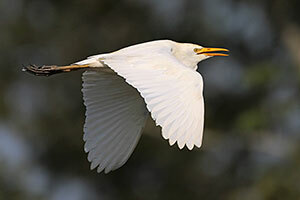 Notes: The stout white Cattle Egret is most often seen in fields rather than shallow water with other herons and egrets. It prefers to follow grazing cattle (hence the name) as well as tractors and mowers, snatching up small lizards and insects that scatter after the disturbance. The Cattle Egret is not native to the Americas; however, it has spread rapidly since it first arrived to northeastern South America from Africa in 1877. It is not known whether their arrival was human assisted or if they made it on their own steam, but since then they have spread rapidly across the western hemisphere. They were first observed in the U.S. in 1941, with the first nests observed in 1953. They are currently common throughout the southern U.S. in summer but have been observed throughout North America, even as far north as Alaska. 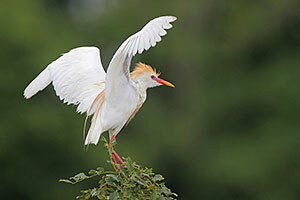 Cattle Egrets are also established year round residents throughout much of Central and South America. These small egrets (18-22 in length) can be distinguished from the slightly larger Snowy Egrets by their short thick yellowish-orange bill, and dark brown legs and feet. They also tend to appear stockier and have a more rapid wing beat when in the air. During breeding, the bill and legs turn a bright reddish orange, and they develop pale orange patches on the back and chest as well as a mohawk of pale orange on their heads. Their diet includes mainly small arthropods and lizards stirred up by disturbances, and they have even been observed flying toward smoke to take advantage of insects fleeing the fire. You can often see Cattle Egrets foraging in newly mowed suburban lawns as well as agricultural fields through Southeast Texas this time of year. Next time you spot this bird take a moment to watch them chase and capture all sort of insects, including dragonflies and grasshoppers!